On Tuesday, February 11, I spent the day with three astronomers at the Fred Lawrence Whipple Observatory on Mt. Hopkins, Arizona, some 60 miles (100 kilometers) south of Tucson and not far north of the Mexican border. It was clear, calm, warm, and with decent transparency, and from the summit of Mt. Hopkins, which houses the magnificent Multiple Mirror Telescope (MMT), you could easily see Nogales, Mexico, to the south and the tiny white domes on Kitt Peak to the west, the latter being 55 miles (90km) away. The MMT’s director, Grant Williams, accompanied me for my visit, along with the Ridge Telescopes Director Emilio Falco and the operations manager for the VERITAS gamma-ray telescope, Pascal Fortin. I thank them all very much for spending so much time with me, as well as Grace Alegria, who coordinated the visit. We slowly drove up the rugged mountain road from the Whipple visitor center and had long periods of talking about the science that’s currently going on at Whipple, involving huge numbers of scientists from Cambridge, Massachusetts, and many other institutions. There’s a great deal of research happening with exoplanets here, with many projects revolving around follow-ups on Kepler Space Telescope data, as well as large numbers of projects happening with respect to high-energy objects — active galactic nuclei, the supermassive black hole in the center of the Milky Way, dark matter research, and many other topics. You’ll see some material from this trip going into the pages of the magazine in the form of future science stories. Seeing the MMT is really an amazing experience. This massive telescope has been an important workhorse on astronomical projects for many years, and its sheer scale is incredible. The cubic building is visible as a tiny block atop Mt. Hopkins for some miles as you approach, and it’s amazing to see once on the summit how the telescope moves — that the building rotates with the scope — and the huge infrastructure that’s involved with instrumentation, the control room, and data reduction — all staffed by a relatively small number of folks. We explored Mt. 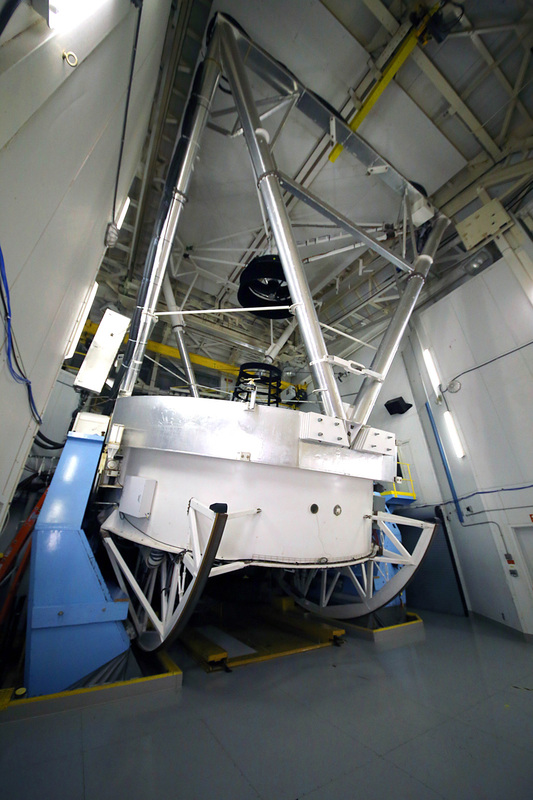 Hopkins thoroughly, also taking in the 1.5-meter Tillinghast Telescope and the 1.2-meter telescope, both of which have produced amazing amounts of research in the past and continue to do so. We also inspected and discussed the HAT telescope — Hungarian-made Automated Telescope — a network of six small 4-inch robotic imaging telescopes that are searching for, discovering, and characterizing exoplanets. We also saw the MEarth array of automated Ritchey-Chrétien telescopes that are searching for exoplanets circling M dwarf stars. Pascal spent time showing me another very impressive undertaking, the four 12-meter telescopes of the Very Energetic Radiation Imaging Telescope Array System (VERITAS). These incredible telescopes with exposed mirrors are gamma-ray detectors, employing photomultiplier tubes — really simple technology — to capture Cherenkov radiation from high-energy gamma rays. The creatures that produce these atmospheric showers that the VERITAS telescopes can detect include high-energy galaxies, black holes, supernovae, and pulsars. I’ll be writing more about the instruments and the science that takes place at Whipple Observatory. For now, thanks again to all the folks who hosted me, and next I repeat the big observatory visit, this time at Kitt Peak National Observatory, one of astronomy’s great collections of large telescopes. And to see more images of my Tucson trip, visit the Reader Photo Gallery.